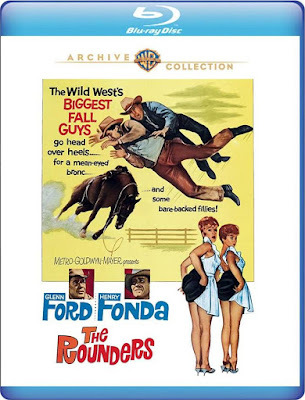 Glenn Ford and Henry Fonda star as a pair of bronco riders who have gone soft in the brains, but still have hopes of making their fortune in the modern Western, The Rounders (1965), now available on Blu-ray from Warner Archive. 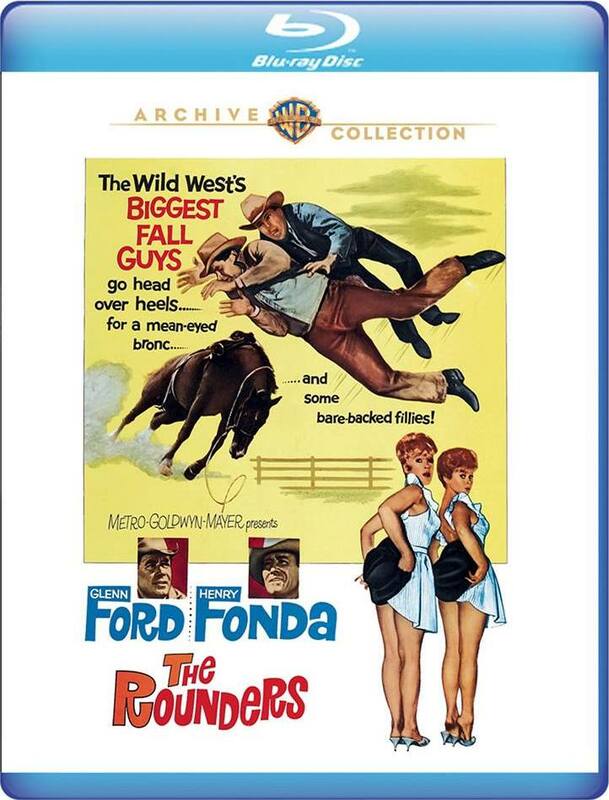 Ford and Fonda are Ben Jones and Howdy Lewis. They make their living breaking wild horses, often for Jim Ed Love (Chill Wills), who seems to be in the habit of talking the pair into things they know better than to do. Despite their attempts to outwit him, they appear to also find themselves frequently in debt to their employer. Love tricks Ben and Howdy into accepting an especially wild steed, which they can't sell, and so end up putting in competition at a rodeo. At first it seems the two have finally found a way to make more than a few dollars a head, but life continues to be more complex than they can fathom. The stars play their own neat trick of making you think they've got a great script to work with. Ford and Fonda were seasoned performers at this point in their careers. They were settled in their bones and seemingly at ease with any nugget of dialogue. So their banter is easy and amusing, and you would maybe conclude clever, but it's really these two overcoming a lot of lackluster chatter with the shine of their personalities. Stunning locations, most of them in Arizona's Coconino National Forest do much to enhance that star power. With bright blue sky and rock formations so vivid they look manufactured, there's no getting used to this magnificent setting. I often got distracted from the action because I was gazing at the scenery. 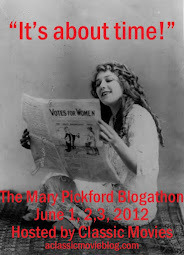 This film isn't much of a place for the ladies. As a pair of shallow strippers the cowboys meet, Sue Ane Langdon and Hope Holiday are no more than empty-headed punchlines. As a pair of farm girls Kathleen Freeman and Joan Freeman seem to exist only to fawn over the much older Fonda and Ford. With cutesie music straining to cue laughs and long scenes that flat line on talk about moonshine, this flick is not anyone's best moment. It is ultimately entertaining because of the easygoing charm of its stars and that gorgeous scenery.